Like all new moms, I too have lost track of how days become weeks, and weeks months. When a festival is around the corner, my elder sister or my MIL act as reminders, suggesting the bare minimum rituals I should follow. This morning, as sonny boy and I went to the park for our daily dose of Vitamin D, I was delighted to see a burst of yellow. Women dressed in yellow, yellow flowers shouting to be picked up at flowers, the familiar freshness in the air and Pandal with Ma Saraswati idol in the colony school – I didn’t take a moment to realize Basant Panchmi – Saraswati Puja is here! While my family doesn’t practice any ritual as such, apart from wearing yellow and preparing sweet yellow pulav, Basant Panchmi occupies a very special place in my heart. Having spent 12 years in a Bengali dominated school; the festival has been a special occasion each year. After all, this was the only day in the year when we could wear the dress of our choice to school instead of the boring uniform! Unlike most kids who save the best dress for birthdays, girls in my school dressed their best on Basant Panchmi. The three day long celebrations provided us the much awaited break from classes, freedom to dress up as we liked, lot of fun, amazing Bengali sweets and bhog, and much needed blessings from Ma Saraswati before the final exams would haunt us! A day before the festival, all eyes would be trained towards the school gate as we waited for Ma Saraswati idol to arrive. The moment we saw the tempo, we would leave everything and rush to the foyer. The entire school echoed with “Bolo bolo Saraswati Mai ki Jai” as we welcomed the goddess with flowers, songs and impromptu dance! For us, this was the day of freedom, fun and festivities! Our usually over protective parents gave us the luxury of giving the school bus a miss. Instead, we girls took our sweet time to dress up our best and arrived at the school on our own, in groups. The security situation wasn’t as sorry as present, so the authorities let open the gates of the senior wings and one could enter and leave school premises at our own wish. For teenagers of a girl’s school, this was nothing short of living the college dream once a year! The senior girls would seize the opportunity to flaunt the best sarees and imitation jewellery, even as the eyes of senior teachers scrutinized the depth of their blouses! Best part would be the Pushpanjali time, when each one of us would pray to Ma for good marks and a bright career! Sounds of “Bolo bolo Saraswati Mai ki Jai” would fill the ramparts as those who waited for their turn took to dancing and singing! Wish we had mobile phones with cameras back then! The alumni also took this occasion to take blessings from Ma and thank teachers for shaping up their careers so well. Morning gave way to the noon in no time and the aroma from the makeshift kitchen in the classroom signalled that the Bhog was ready. Our teachers displayed their culinary skills as they pampered us with the most delicious Bhog – the traditional Khichuri! After Bhog, we would dash to grab our boxes of Prasad which contained an assortment of the best Bengali sweets one could think of! Awwww! I miss my school! As we progressed to senior classes, the later part of the noon became hangout time with friends at Connaught Place before we returned home. This was a moment that came heavy on our hearts as the thoughts of Ma parting left us teary eyed. Moments after the tempo left the school premises, taking Ma away, we would keep looking at the gate with gloom. Then the teachers would lovingly ask us to return to our classes and be good students till Ma returned next year. More than a decade after leaving school and more than a thousand kilometres away from school now, I still feel the fragrance of flowers and incense sticks afresh in my mind. As I recall those wonder years, I pray Ma Saraswati for blessing my little one with knowledge and creativity the way she has been generous to me. To, the Goddess, the mother, and the power – Bolo bolo Saraswati mai ki Jai !!! Ours was an arranged marriage. Unlike majority of my friends who boasted of love marriages, their “I Do” stories and lot of PDA (Public display of affection), mine was a rather shy affair. The only aspect I could boast of was that unlike poles attract, for we were poles apart yet we felt the sparks enough to say yes after just half an hour of meeting! Like most arranged Big Fat Indian weddings of our times, our “I Do” was a rather shy moment in front of our families. As for PDA, well before we could even break the ice, we were married, almost like a miracle! So here we were, a newly married couple, trying our level best to know each other and bridge the gap between those unlike poles. As a new bride, I was in the “impress your hubby” mode, whether by whipping up lip smacking meals, dressing to kill, or charming him by my creative attributes. One morning, sitting on my desk and sipping on my morning cuppa, my mind threw an amazing idea of impressing my cute, lovely and shy hubby. I used to send a Good Morning mail with an inspiring thought to my team, few friends, boss and super boss every morning. As I was drafting the Good morning mail that day, I thought, “Why not add HIM to the mailing list?” I knew he was the intellectual types. So, with all good intentions of impressing my hubby and starting his day on a beautiful note, I marked him too in the mail and hit the “Send” button. Within seconds, I started receiving the usual replies of appreciation and Good morning wishes from my colleagues. But my eyes were desperately looking for this one name in my inbox, while my fingers promptly kept hitting the refresh button. “Would he have liked it, or thought it as yet another forward mail in his inbox?” I was curious to know the reaction. But, before I could even recover from recalling that morning “moment” we had, I was disturbed by a “Hmmm…cozy cuddle” from the next workstation! I was awakened with a start. Was someone peeping into my PC? No. A moment later, my eyes went wide with shock looking at the mail, as if they had witnessed the sun rising from the west! The rest, as you can all guess is indeed a memorable moment of my life! His debut attempt at PDA was read by my friends, team, my boss and to my horror, even my super boss! As I saw my friends share naughty smiles and girls say “Aww, so romantic”, I felt like forcing my tomato red face into the PC screen. A moment later, my mobile flashed with his number. The poor thing had realized his mistake and apparently tried to recall the mail. But the arrow had already left the bow! After a moment of silence on both the sides, suddenly both of us shared a laugh! He - It just happened, I swear! He – They must be teasing you na! Me – Hmmmm (Going super conscious with all eyes on me)…they find it too romantic (almost whispering)! He – But I loved it! He – Your morning cuddle, and oh, uh, the morning thought as well! Me – Well, what was the thought by the way? And we both burst out laughing! The ice was melting faster than we had expected. A true soulmate is the one with whom we can share a good laugh, I had heard. This funny PDA moment proved it as well! As I write this review, Mr. Hubby gives me a mocking smile. Often my liking for old forgotten Hindi movies earn me the title of an alien from the old generation. But I really wanted to write about this one, and by the end of this post you shall know why. I discovered this movie few days ago as I was discussing the good old times with Papa when mom used to sing me this lullaby. This was enough enticement for the movie buff in me and so I decided to watch this movie the same night. Like all old movies, this one too talks of dreams and aspirations among poverty. Pyarelal (Bhagwan Dada) who lives in a small rented house with his family, eats, sleeps and drinks theatre. So much is his passion for theatre that he even daydreams in his office and gets sacked for lack of seriousness at work. Those were the times when acting and creative pursuits weren’t looked high upon. As expected, he gets thrashed by his father for being a burden on his family. His only pillar of support is his younger sister Bimla who believes in his dreams and encourages him to follow his instinct. But have dreams ever helped counter poverty and hunger? Circumstances force Pyarelal to leave the house, leaving a crying mother blessing him success. The big bad world of showbiz treats Pyarelal like any other struggler is treated – with rejection and disrespect. However, destiny takes him on a different track upon his chance meeting with Asha (Geeta Bali). The simple and clean hearted Pyarelal is able to make his way in Asha’s heart and is soon seen fulfilling his dream of a successful actor. Amidst all the glitz and glamour, he is reminded one day of his promise to his mother, that he would return home one day when he becomes a successful actor. However, destiny again plays a cruel game. While on one hand, Pyarelal’s family faces a storm of troubles, the theatre company finds it best to keep him away from his poor relatives, else he might not drift away from the world of theatre. Whether Pyare is able to keep his promise to his family and maintain his stardom is for the viewer to watch and find out, but the movie touches you for its sheer simplicity and pain of a common man. It was also a treat to discover that many songs of this movie are still afresh in our minds as the golden classics. Did you know this movie was the 3rd highest grosser of 1951? You might also wanna read about Bhagwan Dada who once had a 25 room sea facing bunglow in Juhu and a fleet of 7 luxury cars, one for each day of the week, but died amidst poverty in a Dadar chawl. 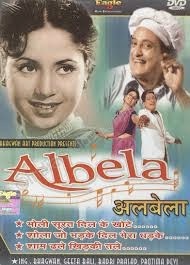 Albela is the movie he is best known for.